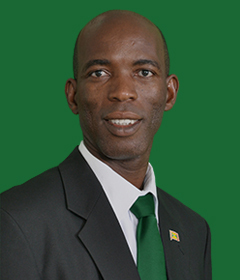 Tobias "Toby" Clement is a Grenadian politician. Tobias "Toby" Clement hails from the sister island of Carriacou and Petit Martinique. Toby's elementary and secondary schooling commenced in 1974 in Petit Martinique. He later attended secondary school in Hillsborough, Carriacou. He later attended the T.A. Marryshow College (TAMCC) where he obtained his Advanced Level certificate and ended his first education phase in 1991. He returned to Carriacou where he taught at the Hillsborough Public School from 1991 to 1995. In 1994, he entered front line politics and became the NNP candidate for Carriacou and Petit Martinique. Although he was unsuccessful, he was later appointed to the Grenada Senate and served as Parliamentary Secretary for Carriacou and Petit Martinique Affairs in the office of the Prime Minister from 1995 to 1996. He later immigrated to the United States of America where he attended he attended Mid Western University between 1996-1999 and obtained a BSc in Biology. After completing his under graduate studies, he worked with various employers which included the Boys and Girls Club of America and North Texas Consulting Laboratory. He later returned to Grenada where he joined the Scientific staff of the St. George University. While in the University employ, he served on various government statutory boards including a stint as Deputy Chair of the Grenada Postal Corporation. Toby and his family reside in Mt. Parnassus, St. Georges. Clement is defending his St. George North East seat for the New National Party (NNP) in the 2018 General Election.